Zilker Park is a large outdoor space surrounding Lady Bird Lake on the outskirts of downtown Austin. It is one of the best places in Austin to exercise, with over 10 miles of running and walking trails and several different water activities. 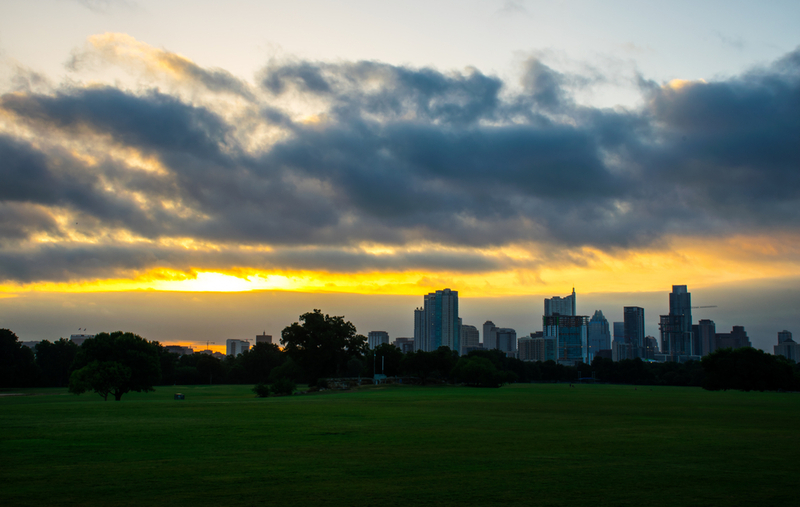 If you’re making a weekend getaway to Austin, Zilker Park is a must-see. Getting out on the water in Lady Bird Lake is also easy to do, with paddle board, kayak, and canoe rentals on site. If you prefer dry land, hike the trails that circle the lake and take in the great views of Austin’s skyline. The park has several amenities such as an off-leash dog park, picnic areas, soccer fields, volleyball courts and even a mini train to ride past Barton Creek. On the south side of the park, you’ll find Zilker Botanical Garden complete with a cascading waterfall. The gardens blend American and Japanese culture in beautiful rose gardens and ponds filled with Koi fish. Kids will love the dinosaur habitats displayed in the Hartman Prehistoric Garden, too. In the hot summer months, stop by Barton Springs Pool, a natural pool fed by the underground springs that has been built up with modern amenities. Maintaining a constant temperature of about 70 degrees, the water is always refreshing. Swimmers will enjoy the three acres of open space and families will love the shallow entry and grassy hills to play on. Note that the pool is closed on Thursdays for maintenance and cleaning. The Austin Nature and Science Center is located on the western side of the park and has many exhibits featuring Texas wildlife and dinosaur exhibits complete with tracks to follow and replicas of the great beasts. Learn about native plants and animals while walking the trails, and enjoy bird and butterfly watching. Stop by the bee hive to see up close how these creatures live and make honeycombs, then head over to the animal rescue area to see some wildlife. One day might not be enough to take in all Zilker Park has to offer!